Pontcysyllte & Chirk aqueducts tunnels narrows bunfights and fun #narrowboat #England – The Diesel-Electric Elephant Company. Loins were girded, caps were set, hatches were battened, gun-ports opened, charts consulted and sails set. Cardinal Wolsey is, by all accounts, a little too deep in the draught for the last few miles of canal to Llangollen itself, but most of the fun stuff may be experienced anyway by steaming to Trevor and winding there. Two experience-savouring days, nine miles return trip, no locks, two tunnels, two aqueducts, some lobe-thrashing narrows with some very silly mooring on display, and a farcical manoeuvre thanks be to the cretinously-daft siting of a hire-boat company’s base – ending, naturally, with the Cardinal moored outside a pub and me wrapping myself around a pint of ale. It was quite a couple of days. Where to begin? Well, we shall begin at the beginning, sort of, and work through to the end. Here’s a map of the “end” point, just to prove the point. Some interesting narrows with tight bends, and some insane CaRT-approved official moorings, reducing the navigation to “you have to be joking” width. Both aqueducts were crossed at mooching-speed. These are listed World Heritage Sites, and I am not going to be responsible for knocking them down, and they’re both more than 200 years old; I am also not going to test their resilience to 18 tons of bash-by-narrowboat. Consequently, you may need tea and biscuits to last through the wild pace of the videos! One the other hand – mooching speed with tea and bicuits is what the canals are, these days, all about… (or ought to be)! I’ve been through this tunnel four times now for various reasons, back and forth, and the only way to see if it is clear is to hover in the tunnel entrance, squint for any sign of light, and if none, just go for it. The second time I went through I was trailing three hire-boats who all assumed that I knew what I was doing. Fools! Please be kind and fail to notice the “kiss-of-the-maiden-aunt” with the towpath as I try to look along the length of the tunnel here. It really was a very gentle kiss, I assure you, and not bad, considering that TWONK of a “trading boat” moored to the right as we came into the winding/marshalling area and making the turn tighter than it need have been. Chirk Marina services were fun, sort of. No, but quite seriously, it was fun in a weird sort of way. The entrance is hidden, narrow and leads to a small basin with no immediate sign of where one might obtain diesel, potable H2O, somewhere to empty the Elsan tanks and buy a couple of packets of Trebor Extra Strong Mints. I thus took a double-shuffle to get into the marina, and once there, went quite literally around in a circle, twice, until it was indicated to me that I should position the Cardinal stern-on to a pontoon alongside a moored thingummy and then yodel for attention. Getting out again to continue our journey was a manoeuvre best performed, even for a non-theist, on “a wing and a prayer”, so to speak. I wunged it, to coin the past tense of “wing”. Whitehouse tunnel was much like Chirk Tunnel, but shorter, and while I have video of that, once you’ve seen one tunnel on the Llangollen you’ve seen enough. The final lift-bridge lies immediately, well – a few hundred yards – before the Pontcysyllte Aqueduct (pronounced correctly, I think, by mimicking the sound made by someone with a lisp simultaneously spitting out a bluebottle and sneezing, followed by a small cough and the word “Aqueduct”). The bridge is the usual “leap off and crank some hydraulic torture mechanism” structure. Being awfully English, while there we waved an oncoming boat through, gratis, and collected a Pied Piper trail of three other boats behind. We indicated to the last of these that perhaps they might like to close the bridge for all of us, terribly splendid ticketty-yah and onwards. If we’d waved the whole queue through then the Bro and I would have been there still. There then follows a right turn (that’s “starboard” or something, isn’t it, in sea-speak?) 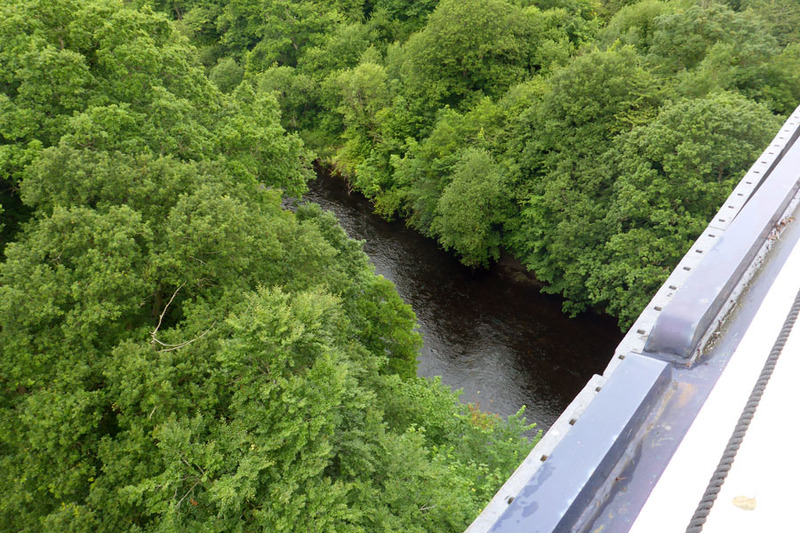 onto a short and very narrow stretch before the Pontcysyllte Aqueduct, a stretch once again clogged with CaRT-approved long-term moorings. ‘Oh my goodness gosh, whatever were they thinking of?‘ I muttered to myself, again. Whomsoever it was that sat in an office somewhere and thought ‘Let’s take the one and only access to a World Heritage Site attracting trillions of foreign tourists and then reduce it to what-the-hell width by allowing long-term moorings‘ deserves a size 11 boot up their Arsenal Villa are doing awfully well again this season, are they not? The arrangement works, but only because those on the return journey from the Aqueduct slip into a parallel dimension one and a quarter inches to the left of our own, more usual, dimension, and between us we thus fold space and time to allow two-way traffic. Yes indeed, Myffanwy. There are no traffic lights, no system of signals, the signs just say to check that there are no boats coming in the opposite direction before sallying forth. I checked, and sallied forth. There really is no guard rail on the boat side of the structure. 126′ down, and all at – if you’ll pardon my “child of the nineteen-sixties and seventies English education system mix of the Metric and the Imperial” – 18 tons x 9.80665 m/s2 should anything go awry. Apparently that skinny cast-iron side to the trough is “sealed with a combination of Welsh flannel and lead dipped in boiling sugar” and “hardly leaks at all”. The Cardinal’s forward video camera is, for the moment, the dashcam that I used to use in the Aston, and it records in five-minute sections. It didn’t like the mixed light conditions very much, so I mun procure a better video camera for the future. Still, here then are the videos of five minutes of us going north, and five minutes of us coming back south. I remind you again of the pace of the canals, and the possible need for tea and biscuits while viewing. That canvas structure to the bottom of screen is the Cardinal’s cratch cover with a couple of ropes slung over it. The view as one screams like a big girl’s blouse enjoys the crossing gets progressively more impressive. The river below is the River Dee of Dozy, Beaky, Mick & Tich fame, Dave. Then, after about ten minutes of crossing time or so, the frightened-as-a-rabbit-in-the-headlights boater (me) is immediately faced with Trevor Basin and the need to turn the boat around – among the queue to cross in the opposite direction, with those behind coming up fast, boats appearing from the entrance to the Llangollen section and, best of all, the utter chaos engendered by there being a thriving Hire Boat Company doing business (as in mooring all of their boats) in the basin, long-term boats three abreast on one side, day boats on the other, and a trip-boat on a mission using the gaps in-between. To put the cherry on the icing on the ginger cake, this is, as previously mentioned, a World Heritage Site – and as such packed to the rafters with camera-wielding tourists. Yes, as I struggled against the traffic, breeze and somewhat perverse current to turn the Cardinal, they all watched, took photos and shot video. The “professionals”, being um… er… “consummate professionals”, rolled their eyes, while half of the “civilian” boaters knew better and the other half just watched and thought “OMG, it’s me next”. I changed target three or four times as the Greek tragedy afloat unfolded, and the Bro was required to walk-jog about eight miles back and forth around the basin to help with ropes and things. Much ta, boyo. Below, a boat on a mission; mission postponed. Music intended to be ironic, see author’s future biography for details of earlier conversation between interested parties, and what happens when someone knows “best”. The Llangollen is, of course, an out-and-back canal. Having been shown the Pontcysyllte Aqueduct by the Cardinal, we had needs must return and retrace our steps back across, through the tunnels and back over the Chirk Aqueduct. There was a bit of a bunfight at the Chirk Aqueduct. Having checked for tunnel lights coming at us and found none, the Cardinal led his little convoy into the tunnel and we chugged back through the 459 yards of darkness. Tunnels are weird, try as I might to settle the boat on a nice straight course down the straight and (very) narrow, it seems that once the water has decided to flow to either port of starboard of our bows the matter is settled. Except for very occasional moments “in the sweet spot” I have steered the Cardinal through all tunnels on some sort of “crabbing” motion. At least no-one can see, and if I tell no-one, then… oh. Did I just type that out loud? I did. Hmm. Now you know. You absolute cads and rotters, that was my turn… I shall photograph you and let that be a lesson to you. Good day, sir. Anyway, as we exited the tunnel into the mini-marshalling/winding-hole area we were, um, “greeted” by a wee floating market of other boats. All of these boats seemed to be disgruntled, a midshipman on one of them (the gentleman here above taking my photo) indeed shouted to the effect that we were out of turn and it should be turn and turn about one boat at a time… An odd notion, given the length of time it would add to the process (and that it just doesn’t work and never has worked that way – I know, I asked the locals). The others just muttered, and flung cabbages, dead cats and filthy looks. We flung them back, with kisses. We gave them all a cheery wave, and the Cardinal showed them his arse as we retraced our steps over the Chirk Aqueduct and far, far away. Well, as far as the lovely moorings right outside The Poacher’s Pocket pub, wherein we fell after securing the Cardinal. Under not some little pressure from the landlord I reluctantly agreed to eat a vegetable Jalfrezi curry – with chips, and was forced to wash it down with a cold pint of Hobgoblin ale. Damn it, man, I’d had a long day, so what did you expect? Some sort of resistance? The Cardinal, snoozing after a long day, on his moorings. So there we have it. We’ve done the big one, the Pontcysyllte Aqueduct, and now we’re headed back deeper into England and more familiar territory. Would I do it again? Yes indeed, perhaps though in Winter, with fewer trip boats on mysterious but deadly-urgent missions. The Llangollen is an odd canal. It is very, very scenic. It was, like all of the others, an industrial and working canal, but somehow these days it seems to be a “tourist” canal, and not so much one to encourage longer stays. The number and positioning of the services indicate a preference for hire-boats rather than privateers, and most especially so not for live-aboard privateers. The moorings, with the exceptions of the shallow edges in some places, are luxury – the whole canal seems to be equipped with armco (just bung on the chains instead of having to bang pins into the towpath). The water level though? Well, suffice it to say that the Llangollen will be a truly lovely canal once they finish filling it with water. If the servants know what’s good for them then my average bath is run deeper than the Llangollen canal. I love these meandering (but straight) journeys and travelogues. Thanks for the trip. One question: did you kiss the sides at any time? Also, I immediately calculated the present day costs of the aqueduct. £372,288,524 But I bet if we made one today it wouldn’t still be standing in 200 years. Definitely wouldn’t be standing, wouldn’t look aesthetically pleasing, and would probably leak. As Ian states two pieces of Welsh linen, ox blood, molten sugar. and lead, are all that joins the separate parts of the cast iron tank. This is still original and hasn’t had any major structural failures in 205 years. They do empty it every couple of years to check the structure(there is a big plug), but just then re-fill it again. Oh and HSE would have a field day!! VIDEOS! I now have my Friday night planned. A bit of vodka and vicarious adventure of hair raising canalling. Can I make canal a verb? It feels like it should be a verb that describes the sort of boating narrow boats do. The Cardinal and I generally “pootle”, but it’s not universal, the boat that just came within a whisker of side-swiping us was more “razzing it” than pootling. Don’t forget your tea and biscuits for the videos – the pace will put you to sleep! Absolutly love the Ponty, must have done it at least 20 times, if not more. My best piece of useless information about this is that only one person died when making it – more died building the channel tunnel. other facts, it was completed in 1812 (of Tchaikovsky overture fame). The pillars are hollow (if they were filled they would explode due to the weight. Enjoy the rest of your sojourn, I am starting my hols this evening, going to exotic Ellesmere Port. Wonderfully invigorating, how far you have come in nautilus procedures. Excellent! O.k. then – not for all the ale in the pub, does that sound more like the truth? The aqueducts sort of creep up on a chap, one moment pootling peacefully along a normal and relatively sane, albeit narrow canal, the next – way up in the air with no visible means of support. I wonder what the horses thought of it in days of long gone by? So scary. Hows our blood pressure? There’s brave! (My best Welsh accent).